Seeing the mighty bison will remind you exactly why our country really is American the Beautiful. bout 90 minutes north of Denver just over the Colorado state border, there is a little ranch in Wyoming called Terry Bison Ranch. There, you are presented with a typical ranch landscape with barn cats, camel, horses, alpacas, and of course, buffalo. 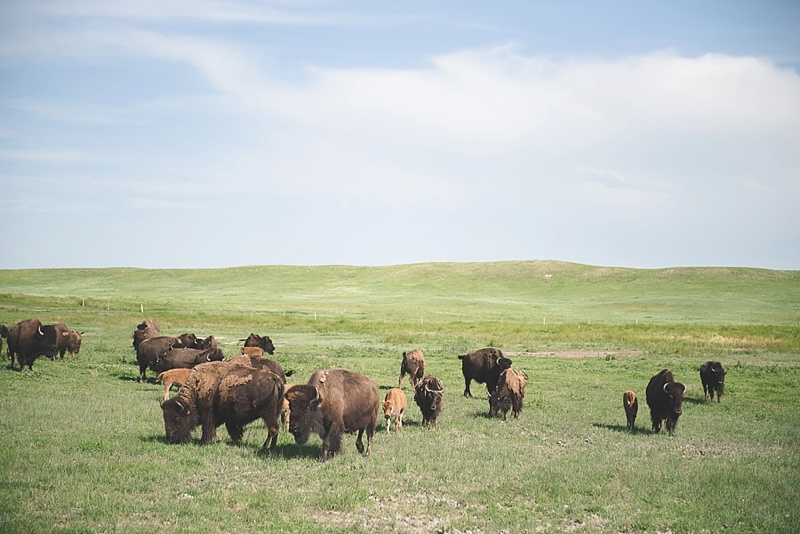 Considered the largest land mammal of North America, the mighty bison are absolutely worth the drive over for a quick afternoon trip if you've never seen them up close and personal before in their natural environment. With fishing, horseback riding, dining, and RV camping facilities, Terry Bison Ranch serves as a typical ranch, but don't expect anything fancy or modern here. As a working farm and tourist spot, it's down to the practical and rustic elements that make the West charming. To see the buffalo, you pay for a $12 train ticket at the Trading Post Gift Shop -- with the trains leaving every hour until the late afternoon. It's a small, simple train system that loops through only a tiny portion of this massive property... and with more than 2,300 bison, you're guaranteed to see this fabulous creature. Quick Tip: Be sure to call ahead to confirm train times! While a reservation is not needed, times do vary depending on the time of year. A wonderful surprise (in which I was ridiculously excited about) was that there were pressed alfalfa pellets we were instructed to give to the buffalo once our train arrived to where one of the herds were! Feeding buffalo will awaken all childhood memories of wonder. Fun fact: These fuzzy beasts have no upper teeth and both males and females have horns. The train ride lasted only 25 or so minutes, but it left an impression of a lifetime. For animal lovers and conservationists everywhere, this 27,500 acre protected private land filled with some of America's greatest beasts will remind you exactly why our country really is America the Beautiful.